yummy. Love u priya. finally pancakes event... I vl be waiting for round up from now only.. I am in..
Lovely theme..priya.. I am in! Very nice event Priya... my son loves pancake and till now have not clicked any pic. Atleast now I can click and post an recipe. Happy hosting. OOh, Priya...will see if I can come up with something innovative! I love pancakes! And I am sure this will be fun to participate! Lovely event will send some enetries. Great event Priya. I have just thing in mind for your event! Very nice event Priya. Will make some pancakes for you . This is cool. I already have a pancake post. Will surely send it in. nice theme.. will try if i can send. I am thrilled! This is a grand idea! Can't wait to do something with pancakes, Lebanese-style of course! Lovely theme! I love Pancakes and have a few on my blog already. Will surely send them over Priya. 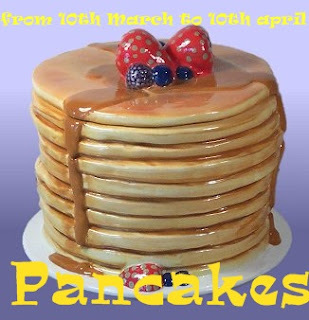 We are not pancake person- I don't know if I can participate for this one! nice event.Will try to send some dear!! Very nice and lovely event. I already send pancakes to u right? shall I send that again for this event? Thanks friends, hope to see all ur entries soon..
interesting event priya, waiting for all those pancakes recipes in one page..
Love it..I have a post..Before I leave for India, I will try to post it! Hi priya! Will surely send my entry!! How I missed this event!!! Nice theme. Going to send at least one for the event. HI there,this is my first time here, really wonderful recipes...You are hosting nice event...i will post my entry! Just now prepared one pancake just for you. will send the picture and entry soon:) Happy hosting dear. hi priya,first time here,wud like to send my entry ,i recently had dutch mini pancakes/poffertjes in a restaurant over here and wanted to try so pls lemme know if this will b counted in ur pancakes event ....do reply as soon as possible. I would like to participate in ths event.Are dosa varieties considered as pancakes too.If yes I would like to send in some of my entries. Sounds lovely! Just sent you my entry Priya!good luck everyone! @Sugar..do send ur entries today yaar, its not late at all..thanks for visiting..